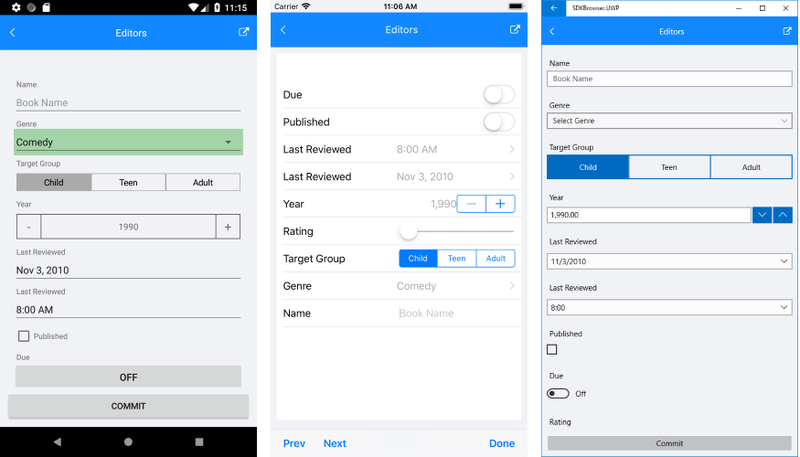 RadDataForm for Xamarin is a customizable component allowing you to easily create a form for collecting or editing business object data. The control supports different commit modes allowing you to commit property values one by one or commit the whole form at once. You could also determine at what moment the properties should be validated choosing between different validation modes. The control lets you use rich set of editors out of the box. Built-in Editors: RadDataForm provides a set of built-in editors for the available primitive types such as numeric, string, Boolean and enumerations. The control detects the types of the data object’s properties and automatically displays the appropriate editor. You can also provide your own custom editor and implement it easily thanks to the rich API of the control. For additional details go to the Editors topic. Validation with Feedback: Telerik DataForm for Xamarin features built-in validation, which gives you full control over the data collected through the control. You could check how to use the validation functionality in Validate and Commit topic. Commit Modes: DataForm provides editing support with three types of commit modes to determine when the edited value should be synchronized with the business object. Read Validate and Commit topic for more info on this. Data Annotations Support: In order to customize the way data is interpreted in DataForm you can use helpers in the form of Data Annotations. RadDataForm provides a number of data annotations, such as ConverterAttribute, DisplayOptionsAttribute, ValidationAttribute and others. For more details go to Data Annotations section in DataForm documentation. Grouping: RadDataForm provides collapsible groups option that will help significantly users to navigate through large lists. For more info check DisplayOptionsAttribute topic. Layouts: Provides support for stack and grid layout. Read more on this in the Layouts article. Read-only Mode: The control has a read-only mode for cases in which the end-user should only see the values of the properties, rather than edit them. Check the ReadOnlyAttribute topic for more details.